This OP-ED was originally published in Music Week on 22 March 2019. As tensions mount ahead of the vote (well, it's not just the UK Parliament that has all the fun), it’s time for new questions about the debate. There is a myth that this directive is only about big corporate interests. Nothing could be further from the truth. They can use muscle. We need a framework so all creators flourish, regardless of their size or where they come from. This is really about the artists and composers you haven’t heard of yet. “We will just see to it that anyone searching for you on Google will find out immediately if you vote for or against the freedom of the World Wide Web. They will find out when they make up their minds on 23-26 May; they will find out later in your career, whatever you do and wherever you go”. Is that the kind of democracy we want? The next European elections and their importance for the future of Europe deserve better. Other anti-Article 13 positioning continues with a vengeance, with Germany bearing the brunt of the attacks. Wikipedia closed down there yesterday for example, even though they and countless other services are specifically excluded from the directive. Some parliamentarians want to get rid of article 13 altogether. Let’s not kid ourselves. At this stage of the process, going against Article 13 cuts through the whole directive. Without this article, the directive – approved by more than 20 EU Member States after years of negotiations - would most certainly never be adopted. And let’s not forget that alternatives have already been examined – in nearly three years, we have been around the houses on this one. So why does the debate continue to be centred around Article 13? Why do we rarely hear about the other provisions in the directive? Have you heard what the European Parliament achieved to include unprecedented harmonised provisions for the benefit of all authors and performers, for example? Do you know what the parliament was able to win in the text with these clauses, or that they need Article 13 to have full effect? Are you aware that the directive also includes new copyright exceptions in the areas of text and data mining for research, education and preservation of cultural heritage? And what about the facts on Article 13? Why don’t we hear how it improves the position of citizens, by shifting responsibility for their uploads to platforms and making copyright exceptions like parody, pastiche, criticism and review mandatory in all member states? Has anyone told you that you don’t need upload filters to apply Article 13, as technologies can identify content without them? Do you know that the rules vary depending on the platform’s size, age, etc or that there is a special regime for small startups? Do you know that services like Wikipedia, GitHub, eBay, DropBox aren’t affected at all because the directive specifically excludes them? Do you know that the text actually bans general monitoring and upholds freedom of expression and other fundamental rights? We have all seen how YouTubers have been orchestrated by Google/YouTube's campaign, employing their own audiences in their propaganda machine. No other media company in the broadcast business would be allowed to use its airwaves to get a competitive advantage over others in terms of advertising, or to resort to political messaging in that way. Has YouTube abused its dominance? The answer is surely yes and this flags a much broader issue than copyright - who wields power in today's online world and the extent to which it can be abused. This is a fundamental question for truth and democracy in Europe and the rest of the world. To get the ball rolling, creator groups have asked YouTube to support a fair and democratic debate by allowing the Europe for Creators campaign #Yes2copyright to message YouTubers and place banner ads before the vote. Let’s take a closer look at the process that has led us to where we are today. The text we have on the table is the result of years of work - thousands of hours of discussions, hundreds of amendments, numerous votes. The final work is down to the fine art of democratic compromise... It is the beauty of the beast. That’s why the directive manages to improve protection for citizens significantly and at the same time establish new rules for platforms, but with a flexible model and a light regime for start-ups. That’s why it also sets out sweeping reforms (Articles -14 to 16a) for authors and performers. And let’s not forget these provisions and Article 13 are two sides of the same coin. The overarching objective is twofold. First, it boosts the user generated economy. Second, it puts those who create and invest in creativity in a position where they can continue to do so, including online, and be fairly rewarded for their work. By updating copyright rules for the digital age, the directive essentially ensures that European cultural and creative sectors, which produce €509 billion in value added to GDP and provide 7.5% of the EU’s work force, can continue to flourish to the benefit of all European citizens. It is the whole package that is key. Here it fosters the unique relationship between authors, artists and their fans online and recognises the importance of encouraging innovation. That’s important because YouTube and other platforms are a vital part of our ecosystem and the current version of article 13 shows that balance is possible. 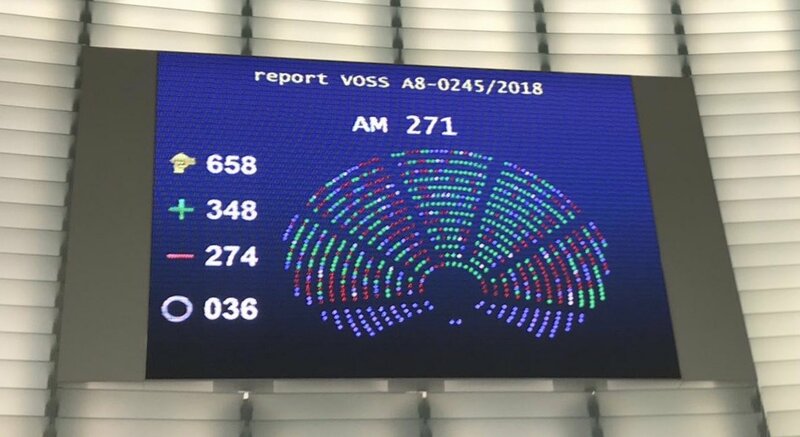 According to a recent poll, 80% of Europeans are in favour of the EU implementing rules to guarantee the remuneration of artists and content creators for the distribution of their content on internet platforms, so let’s get on with it… It’s time to be proud of Europe leading the way. Time to say yes to copyright reform.